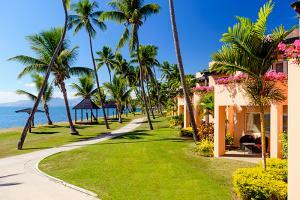 Set on Denarau Beach, this resort is surrounded by 25 acres of lush tropical gardens. The Sheraton Fiji Resort provides guests with an endless array of activities, a variety of bars, and 4 unique restaurants. You may even experience the fascinating and mysterious firewalking. 20 minutes from Nadi International Airport. Kula Bird Park, Suva City, Sigatoka Sand Dunes and Town, Viseisei Village, Castaway Island, Garden of the Sleeping Giant, Nadi Town.